Ashley Osborne, 27, stands with her chilldren, from left, Regis Osborne, 6; Daemeon Cooke, 7; and Nevaeh Osborne, 11, at their Chattanooga home on Nov. 19, 2017. The Osborne's received help from the Chattanooga Times Free Press Neediest Cases fund to repair their car. 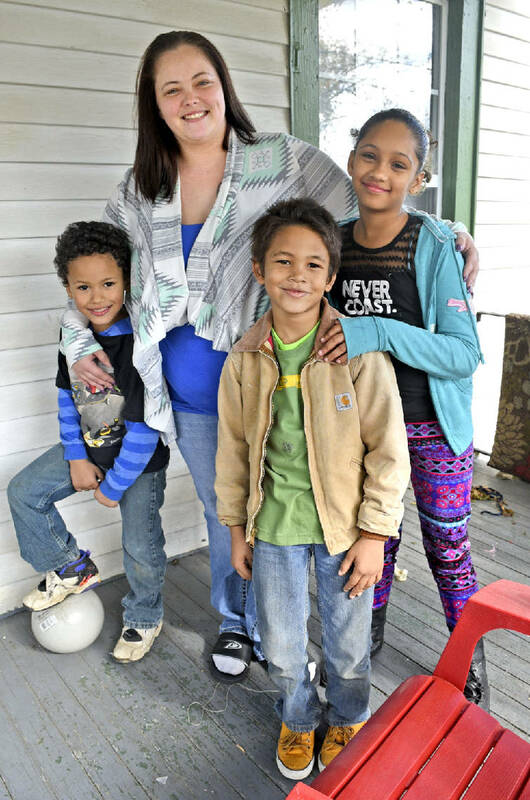 When Ashley Osborne and her children came to Chattanooga from Knoxville two years ago, they were looking for a fresh start, the young mother said as she sat on the front porch of the family's home on a recent afternoon. That start came with very little in the way of a support system, though. 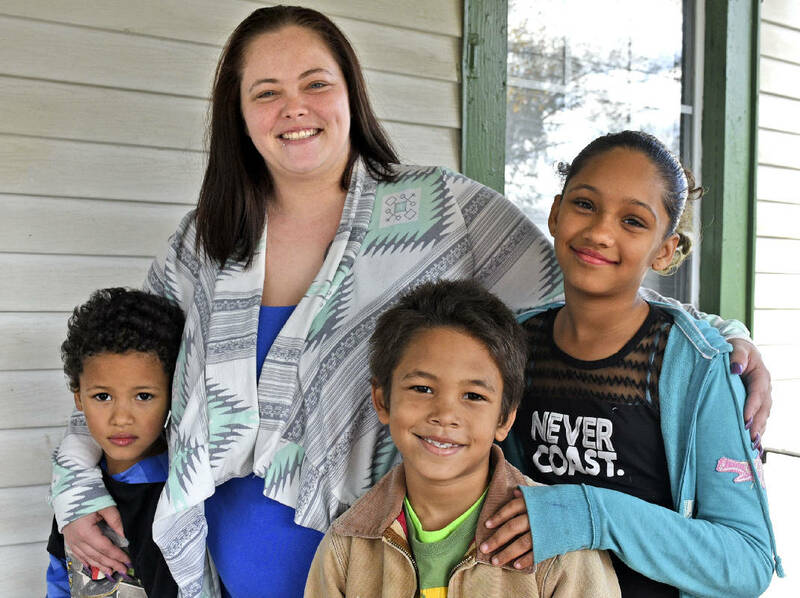 Osborne, 27, recalled the vital help she received from Family Promise of Greater Chattanooga and the Times Free Press Neediest Cases Fund when she needed car repairs and couldn't turn to friends or family for assistance. "That was the only transportation I had," Osborne said. Chattanooga Times Publisher Adolph Ochs started the Neediest Cases Fund in 1914 to help local people in financial need with one-time donations intended to help people get back on their feet. The annual charity appeal, continued by the Chattanooga Times Free Press, provides the opportunity for readers to support their neighbors through financial donations during the holiday season. Clients of a number of local agencies benefit. Ashley Osborne, 27, stands with her chilldren, from left, Regis Osborne, 6; Daemeon Cooke, 7; and Nevaeh Osborne, 11, at their Chattanooga home. The United Way of Greater Chattanooga manages the fund, screens recipients and issues the money. Cary Bayless, marketing and development director for Family Promise, said the fund serves the community in the way it should be served: neighbors helping neighbors. In 2016, the fund helped 241 families with $69,593 in contributions, records show. "If I had some horrific life circumstance, I would be able to call family or friends and they'd be able to support me," Bayless said. "These individuals don't have that help — that's what sets them apart from other people." Osborne received $500 from the fund to purchase a new alternator and other parts for her car. That car was the only means she had to get to work at MAPCO Mart, where she is a manager, and to Clifton Hills Elementary School, where her children — Nevaeh Osborne, 11; Daemeon Cooke, 7; and Regis Osborne, 6 — go to school. Returning home from their friend's house, Regis ran up to his mom and lifted up his T-shirt, so she could see the new scratch on his stomach that wasn't there when he left home. Osborne gently kissed it and sent him off to kick a ball with his older brother in the front yard. As she stood next to her mom on the porch, Nevaeh said she remembers how nice the people at Family Promise were when they moved to the area. Osborne said she was grateful for the help the fund gave when the family was having a difficult time. "It was very helpful," Osborne said. "We were able to do the things that we needed to do." Bayless said it feels good when he can call people and families and tell them they've been approved for the amount of money they need. "Neediest Cases empowers us to really partner with individuals," he said. "It's not offering a handout but offering a hand up."